You have made the important decision to add onto your everyday living space and turn it into a beautifully designed dream home. But before we lift a hammer, it is important to cover “all the bases” involved in a home addition, especially when it comes to estimating the costs. Before attempting to calculate any numbers, you should first decide what type of home addition you want to do. There are numerous types of additions, such as second-floor additions, ground level additions, and detached additions, each having its own set of advantages and costs. 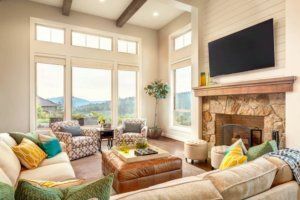 In a design-build scenario, where a firm, such as Republic West Remodeling, may work with clients through the design, engineering, contracting, and build phases, your design-build contractor typically determines a price based on several factors. These include the size of the structure, materials used, the quality of fixtures and finishes, and the complexity of architectural details. Are you going with baseboards or a subtle reveal? Are you opting for closed or open eaves on your gabled roof? Considerations like these can have a significant influence on the final value of your home addition. An Extra Room. Many homeowners opt for an extra bedroom, Arizona room, or “rec” room. In most cases, depending on the square footage of your property, there are two options: build up or build out. Additions can be extensive and involve building an additional structure that fits in with your existing home. A Detached Addition. Detached home additions can range in price and style. Some homeowners opt for a garage addition or casita, perfect solutions for car and tool storage, a separate living quarter, or a quiet workspace. Designers can build garages and casitas as attached or detached. Attached structures have the added benefit of convenience, as they allow for easy access to the main house in inclement weather. Alternatively, detached garages and casitas offer better flexibility regarding both location and size. High-End Details. The quality of the architectural detailing, fixtures, and finishes all influence the overall project price. Expect that any extensive customization, sophisticated finishes, and luxurious materials, such as exotic wood grains, natural stone, and handmade tiles, can impact costs. Numerous factors influence home addition costs. For example, the size and type of room you have in mind impact the price tag. Custom design details and extra features also impact cost but add a unique, one-off quality to your home. Depending on the specific details of your addition, there may also be further expenses to consider. Renovations to your home, for example, may impact your home property taxes and insurance costs. Also, if you live in a gated or private community, there may be homeowner association (HOA) fees to add to the list. We recommend checking with your HOA, municipality, and insurance company to learn more about potential fees. Home addition costs can be broken down into two main categories of materials and labor. For materials, the size and layout of your new space will play a significant role in determining the overall price tag. Working directly with a full-service design-build contractor like Republic West Remodeling will help you to confirm the square footage and overall design of the project before you or your contractor attempts to calculate the actual cost of materials and labor. For some homeowners, this part of the planning process can be a daunting task. At Republic West Remodeling, however, we can help you carefully plan your home addition design using state-of-the-art visual aids and software. Our design team can develop 3D renderings and images to help you visualize what your home addition will look like before construction begins. At this stage, we can also provide an estimated cost for your project. In the end, home additions can be a much more practical and affordable alternative to moving into a new home, especially when you love your current location. As with any other type of remodeling project, a home addition involves many expenses. While some are par for the course, others are more flexible. Either way, it is essential to gain a realistic understanding the factors that influence your home addition cost. Are you ready to take the first step to improving your home? Contact Republic West Remodeling today to schedule your complimentary home addition design consultation.